Waterfront lot with a dock , Great buy !!! Thurmond Lake is the largest U.S. Army Corps of Engineers project east of the Mississippi River. It was built between 1946 and 1954 as part of a comprehensive plan of development for the Savannah River Basin. This lake is one of the 10 most visited Corps lakes in the nation and serves about eight million visitors a year. The dam on the Savannah River is about 22 miles north west of Augusta and is more than a mile long and 200 feet high. It holds back a lake that stretches 40 miles up the Savannah River and 26 miles up the Little River. The lake covers 70,000 acres and has nearly 1,200 miles of shoreline. The lake has more than 100 islands and is one of the largest lakes in the South. Pine trees and hardwoods cover most of the shoreline. Around the lake, you will find six state parks, two county parks, and numerous Corps and private campgrounds. Free camping can be found at Bussey Point, Georgia. The lake's information center can be found at the South Carolina end of the dam just off Highway 221 near Clarks Hill, South Carolina. The center is open year-round except on Thanksgiving, Christmas and New Year's Day from 8 a.m. to 4:30 p.m. in the winter and 8 a.m. to 8:30 p.m. in the summer. 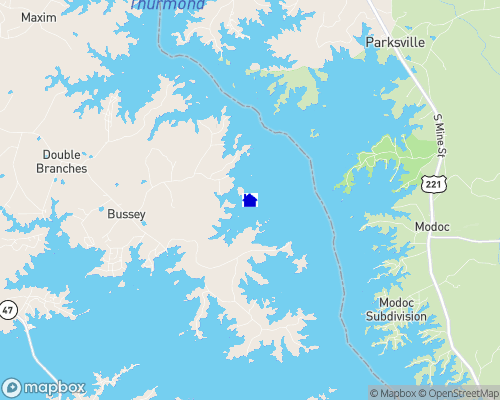 More information about the lake is available from the Resource Manager at Thurmond Lake, Rt.1 Box 12, Clarks Hill, South Carolina 29821 or by calling (803)-333-2476 or (706)-722-3770. J. Strom Thurmond Lake provides excellent striper and black bass fishing and its large wildlife management program provides some of the best hunting and wildlife observation opportunities in the South. The adjacent area abounds with historical and geological sites. The Visitor Center, located at the South Carolina end of the dam, contains numerous exhibits and additional information on the lake and the surrounding area. Water Level: Average water level variance? 3-10 ft. Depth of Lake: 120 ft.